The English common name of this heather is Cornish heath because its area of native occurrence in Britain is on the Lizard Peninsula in Cornwall. The species is vulnerable to changes in grazing regimes and competition from grasses and sedges. Compared to all other heathers, Erica vagans , Cornish heath and E. erigena , the so-called 'Irish heath', are unusual in that the male stamens are longer than the petals so that the brown pollen-shedding anthers protrude from the petal tube. 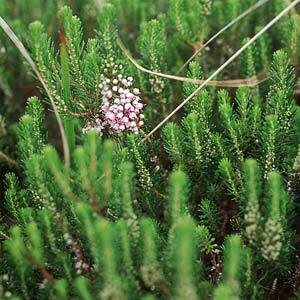 The flower stalks (pedicels) are longer than the flowers in Cornish heath and it grows to about 75cm in height. This woody subshrub can probably reproduce itself by layering of broken branches if subjected to trampling. Heathers in general are not long-lived surviving only 15 to 25 years, or very exceptionally up to 30, perhaps 50 years maximum. Regular grazing and occasional burning helps keep woody crowns and underground parts of shrubs rejuvenated, but in any heath, older individuals must inevitably die from time to time. They must be replaced if the population is to maintain itself. Otherwise, reproduction is by seed, although we are not certain to what extent this is effective in the small, isolated Fermanagh population. Apart from common weeds and trees, seedlings of most wild plant species are only rarely observed. Erica erigena, Irish heath is similarly unusual in that the male stamens are longer than the petals so that the brown pollen-shedding anthers protrude from the petal tube. The flower stalks (pedicels) are longer than the flowers in Cornish heath, and shorter than the flowers in Irish heath. Cornish heath grows to about 75cm in height, while Irish heath can reach 2m, and the latter flowers earlier, in the springtime. This species occurs at Carrickbrawn ASSI. It grows on a stretch of blanket bog acid moss peat in a shallowly hollow hillside, and nearby, just above the riverbank. The sloping ground at the spot is unusual, being flushed by a spring which seeps alkaline, lime-rich water through the rather sandy mineral soil derived from local sandstone and shale, which is overlain with just a thin layer of acid peat (Webb, 1954). Beyond the nutrient-enriched, flushed ground, apart from a few outlying clumps, this unusual heather species is surrounded by completely ordinary, Calluna heath and grassy moorland vegetation. It is better to see it in July or August when the plant is flowering. Relevant access permissions should always be sought prior to visiting any sites. 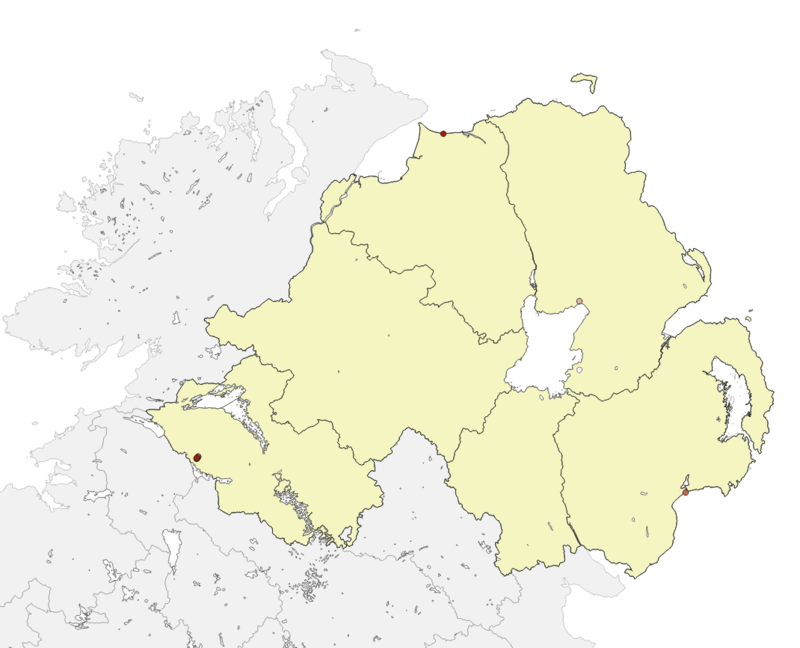 It has been recorded in Northern Ireland at just four sites – on sand dunes at Murlough in County Down and the Umbra, County Londonderry, and near Shane's Castle, County Antrim, all of which definitely were garden escapes (it is a popular garden plant). The fourth station is on a remote blanket bog hillside in County Fermanagh, not far from Belcoo, where it was first discovered around 1935. Here it is thought it just might be native, fitting a pattern displayed by several other very rare Irish heather species with puzzling discontinuous distributions. Several of these other heathers occur in western Ireland from Connemara north to County Donegal, and they are either completely absent in Britain (Erica mackiana, E. erigena and Daboecia cantabrica), or are confined to the south-west, from Dorset to Cornwall (Erica ciliaris and E. vagans). There are two additional isolated records of Cornish heath from the Republic of Ireland: one on a seacliff in County Waterford, dating from 1834, was never refound; the other on a stony hillside west of Lough Swilly in County Donegal, where again we know it was definitely planted and only existed fleetingly. 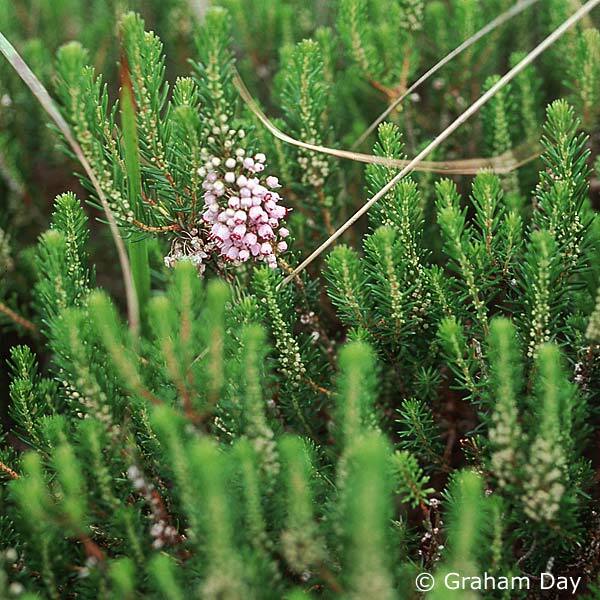 Cornish heath is a member of the small group of plants (15 at most), with disjointed geographical distributions strictly confined to Atlantic-influenced mild climatic conditions. The distribution area of each spans some or all of the following regions: northern Spain, west and north-western France, south-western Britain and south and west Ireland. Cornish heath is listed in Schedule 8, parts 1 and 2 of the Wildlife (Northern Ireland) Order 1985, and is given special protection. Due to its decline and extreme rarity on an all-Ireland basis. Visual estimates from 1938 onwards suggest two-thirds of the Carrickbrawn colony has disappeared during the last 70 years. Previously the ASSI area was grazed by cattle, but for 25 years sheep have been substituted. Despite the grazing regime, grasses and sedges are choking the heather. Changes in selective browsing, the level and timing of overall grazing pressure could lead to increased competition from less palatable plants. Trampling disturbance by the cows probably helped provide vegetation gaps for Cornish heath seedling establishment. The site where Cornish heath occurs is designated as Carrickbrawn ASSI. Records of new sites and estimates or counts of the sizes of populations are always valuable. Send information (with photographs, if obtained) to The Botanical Society of the British Isles c/o Botany Department, National Museums Northern Ireland, 153 Bangor Road, Cultra, Co. Down, BT18 0EU or to CEDaR, National Museums Northern Ireland, 153 Bangor Road, Cultra, Co. Down, BT18 0EU, Tel: 028 9039 5256, cedar.info [at] nmni.com. Griffiths, M. (ed.) (1994). Index of Garden Plants. The New Royal Horticultural Society Dictionary. Macmillan, London. Nelson, E.C. (1989). Heathers in Ireland. Botanical Journal of the Linnaean Society 101: 267-277.